RENT is one of those musicals I never got around to seeing when the professional production toured in 1999. Even though it had a 12 year run on Broadway, won a Tony Award and even had the story of the intriguing unprompted death of the creator, Jonathan Larson the night before the off-Broadway premiere I still didn’t’ madly dash out to see RENT, it just never really appealed to me. 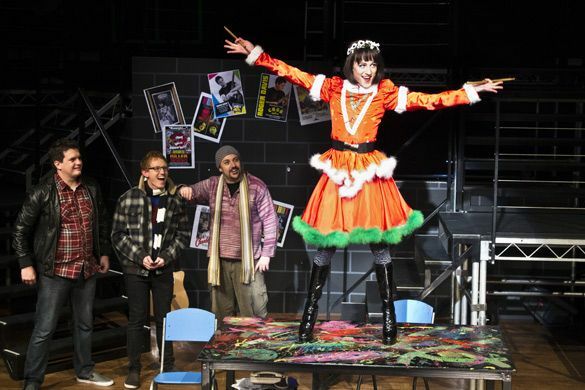 Chatswood Musical Society’s production of RENT introduced me to the world of the mid 90’s drug addled, disease struck struggling avant-garde artists, in New York’s, Manhattan. For a local, amateur group, CMS can boast a line up of great young talent including Hayden Barltop who played ‘Angel’, Barltop was extremely fitted for the part(s) and a duck to water in platform heels! Liam Whan played the lead role of ‘Roger’, image wise I didn’t think he really looked like a ‘struggling artist’ but vocally he was extremely on top of his game. The two strongest vocalists were Amy Toledano and Fiona Hamilton who play ‘Maureen’ and ‘Joanne’ respectively. These two women were the most professional and obviously have the broadest experience. Another superb vocalist who deserves a mention is ensemble artist Victoria Mahy who sings with the power of an African-American black soul singer, just a sensational vocal talent! The choreography needs work, the movement for the performers looked unnatural and didn’t seem to sync with this particular style of musical, however the band were great and pumped out the hit numbers including: ‘I Should Tell You’, ‘Seasons of Love’, ‘Take Me or Leave Me’, ‘Goodbye Love’. The band were well positioned on the set, tucked under the upper section, sometimes the music was sucked into the set rather than reaching the audience, but the musicians played really well led by Musical Director Steven Kreamer. Matt Cater deserves credit for his direction of this production of RENT for Chatswood Musical Society, he has chosen a strong group of performers who deliver with energetic execution and thoroughly entertain audiences! Welcome to Rent! One of my favourite musicals and I really enjoyed this production. Most people would consider Mark to be the leading role however, not Roger. Nice review!! Thanks for reading and glad you’re a RENT lover too!! Next Post WIN PASSES TO SEE FOOTLOOSE!